For the recent convention, see 2016 Republican National Convention. The Republican National Convention (RNC) is a series of presidential nominating conventions of the United States Republican Party since 1856. Administered by the Republican National Committee, the stated purpose of the convocation is to nominate an official candidate in an upcoming U.S. presidential election, and to adopt the party platform and rules for the election cycle. Like the Democratic National Convention, it signifies the end of a presidential primary season and the start of campaigning for a general election. In recent years, the nominee has been known well before the convention. Some 2,472 delegates have attended the 2016 Republican National Convention in Cleveland, Ohio, July 18–21 to select the presidential nominee. The winner must carry 1,237—half of the total, plus one. If no single candidate has secured a majority of delegates after the first ballot, a brokered convention results. It has not happened since the 1976 Republican National Convention. Historically, the convention was the final determinant of the nomination, and often contentious as various factions of party insiders maneuvered to advance their candidates. Since the almost universal adoption of the primary election for selecting delegates in the last quarter of the 20th century, however, the convention's significance has diminished. The national party focuses on the convention as a unity point to bring together a party platform and state parties by having delegates vote on issues, which the nominee can then incorporate into his presidential campaign. The size of delegations to the Republican National Convention, for each state, territory, or other political subdivision, are determined by Rule 14 of the party's national rules. The rules use a mix of at-large delegates (the number of which is equal among states, but not territories), delegates based roughly on population (using the number of United States House of Representatives members allocated to a state), and delegates awarded based on the state party's success in electing or supporting Republican candidates at the national and state levels. The national committeeman, the national committeewoman and the chairperson of the state Republican Party of each state, American Samoa, the District of Columbia, Guam, the Northern Mariana Islands, Puerto Rico, and the U.S. Virgin Islands, are automatically nominated as delegates to the national convention. (The Republican Party does not have superdelegates as does the Democratic Party; the only delegates automatically seated based on official party position are these three persons.) In addition, each of the fifty states (but not territories or D.C.) are allowed ten additional at-large delegates. Each state is allowed three district delegates for each member of the United States House of Representatives. In lieu of Congressional delegation delegates, non-state political subdivisions are allowed specified numbers of delegates: 16 from D.C., 20 from Puerto Rico (but if it becomes a state prior to the next election, the number is calculated using the three per House member rule), and six each from American Samoa, Guam, the Northern Mariana Islands, and the U.S. Virgin Islands. A state can earn additional delegates if the state voted in the plurality for the GOP candidate. If the state casts at least a majority of its Electoral College votes for the Republican nominee in the preceding presidential election, the state can earn four and one-half delegates at large plus a number of the delegates at large equal to 60 percent of the number of electoral votes of that state; all fractions are rounded upwards. Should Puerto Rico become a state between national conventions, it would earn additional delegates under this provision regardless of whether its voters supported the GOP or Democratic candidate. Should the District of Columbia cast its electoral votes, or a majority thereof, for the Republican nominee for President of the United States in the last preceding presidential election, it shall be permitted four and one half delegates at large plus the number of delegates at large equal to thirty percent (30%) of the 16 delegates at large allotted to the District of Columbia, rounding any fraction upward. Each state can earn additional delegates based on how well the state party does in electing candidates to state and national elections. The accomplishments are determined in the year of the last preceding presidential election or at any subsequent election held prior to January 1 of the year in which the next national convention is held. As such, a state is not penalized if (for example) it had a Republican Governor then voted a Democratic governor into office, but if the state had a Democratic governor then voted in a Republican governor it is rewarded for taking the seat. One alternate delegate is also awarded for each regular delegate, except for members of the Republican National Committee. The composition of the individual state and territory delegations is determined by the bylaws of their respective state and territory parties. Since 1972, almost all have appointed delegates by primary election results, although some, notably Iowa, use caucuses, and others combine the primary with caucuses or with delegates elected at a state convention. In the past, competing factions of a state party sometimes drew up separate lists of delegates, each claiming to be the official one. One of the first agenda items at a convention is therefore credentialing, whereby the Credentials Committee determines which group is recognized as the official delegation. To show the calculation of a state's delegation, and the effect that both population and GOP success within a state has on the delegation's size, the following examples (for the 2016 convention) are provided for three states: Texas, California, and Wyoming. Under the at-large rule, Texas is allowed 13 delegates (the chairperson of the Texas Republican Party, the state national committeeman, and the state national committeewoman each count as one delegate, plus the ten allowed for each state). Under the Congressional delegation rule, Texas has 36 members in the House of Representatives; thus, Texas is allowed 108 delegates (36 * 3). Under the Presidential support rule, as Mitt Romney carried Texas in the 2012 United States Presidential Election, and as Texas has 38 electors (36 House members plus its two Senators), Texas is allowed an automatic 4.5 delegates plus an additional 22.8 delegates based on electoral size (38 * 60%), for a total of 27.3 (4.5 + 22.8), rounded upward to 28 delegates. Of the 36 current members of the Texas delegation within the House of Representatives, 25 are Republicans; thus, Texas earns one additional delegate under this provision. Both houses of the Texas Legislature are controlled by the Republican Party (98–52 in the Texas House of Representatives and 20–11 in the Texas Senate) and both chambers are presided over by a Republican (Joe Straus as the Speaker of the House, and Dan Patrick as Lieutenant Governor, which presides over the Senate); thus, Texas two additional delegates under this provision (one for having at least one chamber meeting the criteria, and one for having both chambers meet the criteria). Both United States Senators from Texas are Republicans (John Cornyn and Ted Cruz); thus, Texas earns two additional delegates under this provision (one for each Republican Senator). The Texas delegation would thus consist of 10 (at large) + 3 (chairs) + 108 (Congressional delegation) + 28 (state carried for Republican Presidential Candidate) + 1 (Republican Governor) + 1 (majority Republican state delegation within the House) + 2 (both state legislative chambers majority Republican and both presided by Republicans) + 2 (two Republican Senators) = 155 members. Under the at-large rule, California is allowed 13 delegates (the chairperson of the California GOP, the state national committeeman, and the state national committeewoman each count as one delegate, plus the ten allowed for each state). Under the Congressional delegation rule, California has 53 members in the House of Representatives; thus, California is allowed 159 delegates (53 * 3). Under the Presidential support rule, as Mitt Romney failed to carry California in the 2012 United States Presidential Election, California is not allowed any additional delegates. The current Governor of California (Jerry Brown) is Democrat, and California has not elected a Republican Governor within the past four years (Brown was first elected in 2010). Of the 53 current members of the California delegation within the House of Representatives, the majority are Democrats, and California has not had a majority-Republican delegation within the past four years. Both chambers of the California Legislature are controlled by the Democrats, and the Republicans have not held a majority in either chamber within the past four years. Both United States Senators from California are Democrats (Barbara Boxer and Dianne Feinstein), and California has not elected a Republican Senator within the past six years (both Boxer and Feinstein were elected in 1992; Feinstein in a regular election and Boxer in a special election). The California delegation would thus consist of 10 (at large) + 3 (chairs) + 159 (Congressional delegation) = 172 members, or only 11% more than those from Texas despite being a considerably larger state (its Congressional delegation is over 47% larger than Texas' Congressional delegation). Under the at-large rule, Wyoming is allowed 13 delegates (the chairperson of the Wyoming GOP, the state national committeeman, and the state national committeewoman each count as one delegate, plus the ten allowed for each state). Under the Congressional delegation rule, Wyoming has a single member in the House of Representatives; thus, Wyoming is allowed three delegates (1 * 3). Under the Presidential support rule, as Mitt Romney carried Wyoming in the 2012 United States Presidential Election, and as Wyoming has three electors (its single House member plus its two Senators), Wyoming is allowed an automatic 4.5 delegates plus an additional 1.8 delegates based on electoral size (3 * 60%), for a total of 6.3 (4.5 + 1.8), rounded upward to seven delegates. One additional delegate as the current Governor of Wyoming (Matt Mead) is Republican. As the single member of the Wyoming delegation within the House of Representatives is Republican (Cynthia Lummis); thus, one additional delegate under this provision. As both houses of the Wyoming Legislature are controlled by the GOP (52-8 in the Wyoming House of Representatives and 26–4 in the Wyoming Senate) and both chambers are presided over by a Republican (Kermit Brown as the Speaker of the House, and Phil Nicholas as President of the Senate), two additional delegates (one for having any chamber meeting the criteria, and one additional for having both chambers meet the criteria). As both United States Senators from Wyoming are Republicans (John Barrasso and Mike Enzi), two additional delegates. The Wyoming delegation would thus consist of 10 (at large) + 3 (chairs) + 3 (Congressional delegation) + 7 (state carried for GOP Presidential Candidate) + 1 (GOP Governor) + 1 (majority GOP state delegation within the House) + 2 (both state legislative chambers majority GOP and both presided by Republicans) + 2 (two GOP Senators) = 29 members. This is approximately 18.7% of the Texas delegation, even though the Census estimate of the 2012 population of Wyoming (576,412), is only 2.2% of that for Texas (26,059,203). Comparing the three states in terms of population, California gets one delegate for every 221,171 residents, Texas gets one for every 168,124, and Wyoming gets one for every 19,876. The first Republican National Convention was held at Lafayette Hall in Pittsburgh on February 22–23, 1856. At this convention, the Republican Party was formally organized on a national basis, and the first Republican National Committee was elected. The first Republican National Convention to nominate a presidential candidate convened from June 17–19, 1856 at the Musical Fund Hall in Philadelphia. The 1860 convention nominated the first successful GOP presidential candidate, Abraham Lincoln of Illinois and nominated Hanibal Hamlin of Maine for Vice President. The 1864 event, with the American Civil War raging, was branded as the "National Union Convention" as it included Democrats who remained loyal to the Union and nominated Andrew Johnson, who had been elected Governor of Tennessee as a Democrat, for Vice President. The 1912 Republican convention saw the business-oriented faction supporting William Howard Taft turn back a challenge from former president Theodore Roosevelt, who boasted broader popular support and even won a primary in Taft's home state of Ohio. Roosevelt would run on the Progressive Party ticket, handing the election to Democrat Woodrow Wilson. The 1924 Republican convention made history by being the first GOP convention to give women equal representation. This was the first time the Republican Convention was held in Cleveland, Ohio. It was also the first time any convention was broadcast over radio – to nine cities through a special link over long distance telephone lines. The Republican National Committee approved a rule providing for a national committee-man and a national committee-woman from each state. Incumbent President Calvin Coolidge was formally nominated and went on to win the general election. The convention nominated Illinois Governor Frank Lowden for Vice President on the second ballot, but he declined the nomination. This is the only time a nominee refused to accept a vice-presidential nomination. The Republicans returned to Cleveland in 1936 in the cavernous Cleveland Public Auditorium. Former President Herbert Hoover addressed the delegates on the second day of the convention. On the third, Alf Landon of Kansas (who did not attend) was nominated for President; Col Frank Knox was nominated as Vice Presidential candidate. Landon and Knox were defeated in a landslide by FDR and John Nance Garner. Knox subsequently served as Secretary of the Navy in the Roosevelt administration. The 1940 convention was the first national convention of any party broadcast on live television. It was carried by an early version of the NBC Television Network, and consisted of flagship W2XBS (now WNBC) in New York City, W3XE (now KYW-TV) in Philadelphia and W2XB (now WRGB) in Schenectady/Albany. The growing importance of primaries became evident at the 1964 Republican National Convention in San Francisco, where Arizona Senator Barry Goldwater won the nomination, easily turning away Governor William Scranton and others more favorable to the party establishment. 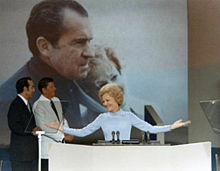 First Lady Pat Nixon speaks to the delegates at the 1972 Republican National Convention. She was the first Republican First Lady to do what is now considered common practice. At the 1972 convention, First Lady Pat Nixon became the first First Lady since Eleanor Roosevelt and the first Republican First Lady to deliver an address to the convention delegates. It is now common practice for the presidential candidate's spouse to deliver an address to the delegates. Also in 1972, the placing of "Favorite Son" candidate's names into nomination was banned, requiring at least five states' request to do so. In recent years, only one candidate's name has been put into nomination, and challengers have been put under intense pressure to withdraw in order for the vote to be unanimous. An exception was in 1976, when former California Governor Ronald Reagan nearly toppled incumbent President Gerald Ford at the convention in Kansas City. Gerald Ford was only in office for two years before he was challenged by Reagan, who was a fellow Republican. Reagan was on record saying that fellow republicans should never talk bad about one another, but Reagan's view had since changed, but the power of incumbency was too much for Reagan to overcome.This was the last GOP convention where the outcome of the nomination was in doubt. After the Republican National Convention, the pressure was on Ford to cut way the factionalism in his Republican Party. Pat Buchanan delivered a speech enthusiastically endorsing the conservative side of the culture war in American society at the 1992 Republican National Convention in Houston. It was widely criticized for supposedly alienating liberal and moderate voters who might otherwise have voted for the moderate nominee and then-incumbent president, George H. W. Bush. Division in the party was evident too at the 1996 convention, at which more moderate party members such as California governor Pete Wilson and Massachusetts Governor William Weld unsuccessfully sought to remove the Human Life Amendment plank from the party platform. The 1996 convention at the San Diego Convention Center remains the last Republican Convention to be held in a convention center complex; all others since then have been held at sports stadiums or arenas. The Republican Party chose Cleveland, Ohio as the site for its 2016 Presidential Nominating Convention. The convention was held in Quicken Loans Arena, home of the 2015–16 NBA season champion Cleveland Cavaliers. There may have been political reasons for the selection, as no Republican has won the presidency without winning Ohio since Abraham Lincoln in 1860. Cleveland's home county, Cuyahoga, has voted 19 times for Republicans and 21 times for the Democratic candidate since 1856. However, the Democrats have carried the county for the past 40 years. ^ "The Path to a Presidential Nomination". WSJ Online. February 2, 2016. ^ "Call of the 2016 Republican National Convention" (PDF). Republican National Committee. Retrieved March 8, 2016. ^ Ward, Jon (March 4, 2016). "Why Donald Trump would be at a disadvantage in a brokered convention". Yahoo! Politics. Retrieved March 8, 2016. ^ "Encyclopedia of Cleveland History". Case Western Reserve University. 22 July 1997. Retrieved 14 December 2015. ^ "Encyclopedia of Cleveland History". Case Western Reserve University. 27 March 1998. Retrieved 14 December 2015. ^ "First Lady Biography: Pat Nixon". The National First Ladies Library. 2005. Retrieved 2007-08-15. ^ Scherer, Michael (8 July 2014). "5 reasons to be delighted and worried about a GOP convention in Cleveland". time.com. Time, Inc. Retrieved 14 December 2015. Wikimedia Commons has media related to Republican National Convention.